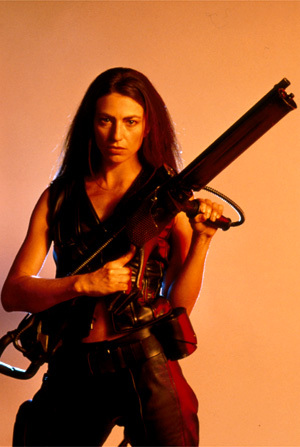 Claudia Black portrays Aeryn Sun, a humanoid Sebacean Peacekeeper who becomes a reluctant participant in the fleeing prisoner ship, in the SCI FI original series, Farscape. Born to be a warrior and sublimate her feelings, Aeryn is a commando-trained pilot who finds herself romantically drawn to Crichton. Black recently completed USA Films' Pitch Black directed by David Twohy (The Fugitive). She will also appear as the lead in the upcoming film Good Fruit. Black has appeared in many of Australia's popular TV series and movies. She is well-known to Australian audiences for her portrayal of the hermaphrodite Jill Mayhew in Good Guys Bad Guys, the leading role of Angela Kostapas in City Life. She also appeared in the series GP, Police Rescue, A Country Practice, Water Rats and Seven Deadly Sins, in addition to several guest starring roles in Hercules. A finalist in the 1990 Globe Shakespeare competition, Black's theatre credits include Portia in the European tour of The Merchant of Venice, Jo in Little Women, The World Knot for the Bicentennial Opera, Spotlight on Women, Portrait of Dorian Gray, Loose Ends, and Pick Ups for the Belvoir Street Theatre. Black's talents include professional singing with a concentration in jazz and classical music.